How can I monitor one PRTG instance with another instance of PRTG? I would like to monitor my instance of PRTG Network Monitor to make sure it is up and running. To do this, I want to install the Freeware Edition of PRTG on another server and setup a monitoring for my "productive" instance of PRTG from there. How can I do that? Of course, you can use one installation of PRTG to monitor another installation. Usually, a Freeware Edition with up to 10 sensors is sufficient to monitor the vital processes of your "productive" PRTG installation. You can even restart the PRTG services remotely! In this scenario, there is a productive system with your PRTG system that monitors your network and a monitoring system that monitors your productive system and can be a Freeware Edition of PRTG. You have different options and can choose what exactly you want to monitor with your monitoring system. This article will describe three out of many other options. The easiest way is to check if the PRTG login page is available. 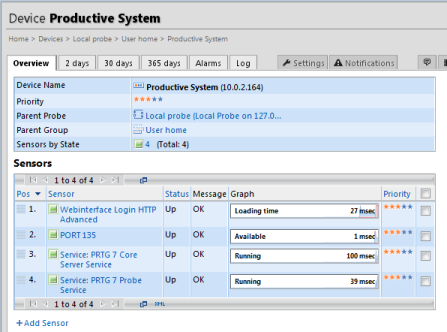 On the monitoring system, create a device with the IP address or DNS name running your productive system of PRTG. In the "Response must include" field, enter the string PRTG Network Monitor to make sure the loaded web page actually is the PRTG login page and not an error page. Leave other settings unchanged and click on Save. The new sensor will start monitoring immediately and should display a green "OK" status after a few seconds. Whenever the login page of your productive system is not available the sensor on your monitoring system will switch to a red "Down" status. You should add a notification trigger for that sensor so you will be notified in case the sensor is "Down". See user manual section Notifications for more details. You can also monitor the services of your productive system, using a WMI sensor. If not inherited, enter Credentials for Windows Systems of your productive system on the device's "Settings". Select Start/Restart Service -> Activated at the end of the list. This will remotely restart the services on the productive system in case of a failure. The new sensors will start monitoring immediately and should display a green "OK" status after a few seconds. Whenever one of the services stops, the sensor will turn switch to a red "Down" status and the PRTG monitoring system will try to restart the service on the productive system remotely. You should however add notification triggers for these sensors so you will be notified in case the sensor is "Down" and "Up" again. See user manual section Notifications for more details. Tip: Make sure no firewall settings on either side are blocking the connection. You should also add a port sensor for port 135 (usually used for RPC - needed für WMI) to make sure that the port is reachable. For even more advanced monitoring, you can directly monitor PRTG's processes, for example the Core and the Probe process. Using a WMI Process sensor, you can monitor the processes' current memory usage ("Working Set", "Commit Size") and Processor Time. In the "Executable" field, enter PRTG Server to monitor the PRTG Core Server service. Create another WMI Process sensor for PRTG Probe to monitor the PRTG Probe service. When entering the sensor's settings, click on the Notifications tab to add Threshold Trigger(s). For example, you can set triggers to be notified when your PRTG productive system reaches certain memory usage or Processor Time. See user manual section Notifications for more details. Of course, you can also monitor other parts of your PRTG productive system, for example certain data files. For an overview of PRTG's data paths, please see How and where does PRTG store its data?